At the age of 29, just five years after they met, John Rybicki’s wife, the poet Julie Moulds, was diagnosed with cancer. Here, in poems raw and graceful, authentic and wise, Rybicki pays homage to the brave love they shared during her 16-year battle and praises the caregivers—nurses and doctors and friends—who helped them throughout. He invites readers to bear witness to not only the chemotherapy, the many remissions, and the bone marrow transplants, but also the adoption of the couple’s son, the lifted prayers, the borrowed time, and the lovers’ last touches. A husband smashes an ice-cream cone against his forehead to make his wife laugh. He awakens in the middle of the night to find their dog drowsing atop a pile of her remnant clothes. The lamentations and celebrations of When All the World Is Old create a living testament to an endless love. Braided with intimate entries from Moulds’s journal, these poems become the unflinching and lyric autobiography of a man hurtling himself headlong into the fire and emerging, somehow, to offer a portrait of light and grace. Kwame Dawes compiles the work of more than two dozen African American poets from the Carolinas, showcasing a vast array of original voices writing on subjects ranging from Jim Crow to jazz, haunted landscapes to romantic love—all in an attempt to define the South as home. The poets range in notoriety from National Book Award winner Terrance Hayes, PEN American Open Book Award winner Nikky Finney, and Ansfield-Wolf Book Award winner A. Van Jordan to poets less recognizable by name whose work readers will immediately recognize as powerful, musical, and accomplished. What is in these pages is nothing less than a significant part of the contemporary poetry scene in America, as well as a piece of American history that in the past has not received its due credit. With Home is Where, that credit is finally bestowed. Rooted in places like Watauga County, Goshen Creek, and Dismal Mountain, the poems in Ron Rash’s fourth collection, Waking, electrify dry counties and tobacco fields until they sparkle with the rituals and traditions of Southerners in the stir of their lives. In his first book of poetry in nearly a decade, Rash leads his readers on a Southern odyssey, full of a terse wit and a sense of the narrative so authentic it will dazzle you. As we wake inside these poems, we see rivers wild with trout, lightning storms, and homemade churches, nailed and leaning against the side of a Tennessee mountain. A two-time PEN/Faulkner Award finalist, Rash has been compared to writers like John Steinbeck and Cormac McCarthy. With his eye for the perfect detail and an ear for regional idiom, Rash furthers his claim as the new torchbearer for literature in the American South. Here is a book full of sorrow and redemption, sparseness and the beauty of a single, stark detail—the muskellunge at first light, a barn choked with curing tobacco, a porch full of men and the rockers that move them over the same spot until they carve their names into the ground, deeper, even, into the roots where myths start, into the very marrow of the world. 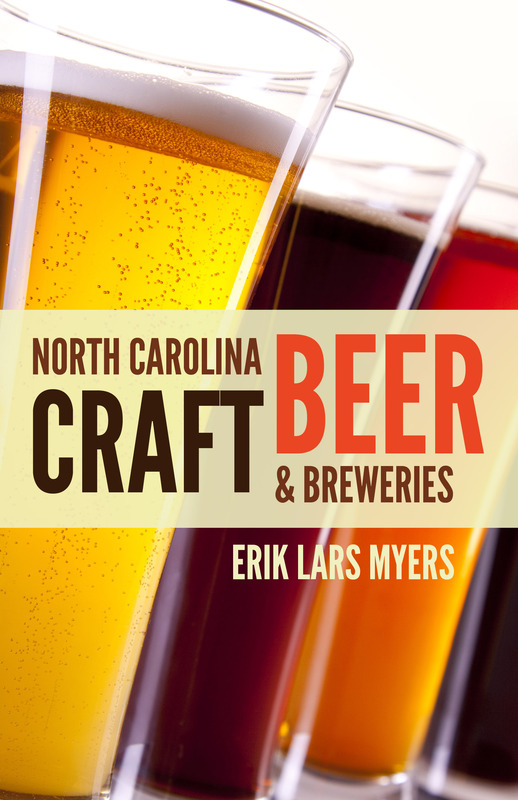 This Wednesday, Erik Lars Myers will be at Carrboro Beverage Company to talk beer and sign copies of his new book, North Carolina Craft Beer & Breweries. Carrboro Beverage Company, the bottle shop associated with Tyler’s Taproom next door and the Speakeasy around the corner, is warm and bright, with hardwood floors, fully stocked coolers to build your own six packs, and an assortment of treats—coffee, wine, specialty sodas, and LocoPops—for those less inclined to beer. In warmer months, the door to the Shop is usually propped open, and pedestrians wander in off Carrboro’s Main Street to see what’s on tap and chat with the Shop’s seriously knowledgeable staff. Below, Dan Warfield, Carrboro Beverage Company employee and friend of Blair, tells us a little more about beer and working at the bottle shop. 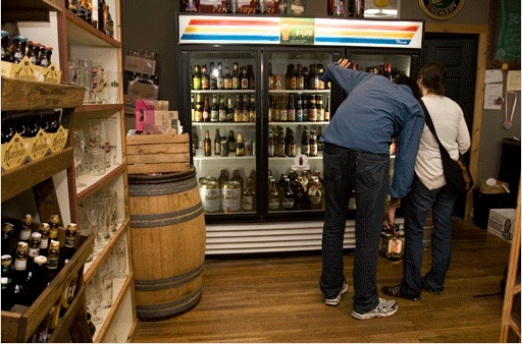 What is your favorite thing about working at Carrboro Beverage Company? Without a doubt the best thing about working at the Shop is being surrounded by people—staff and customers—with a great enthusiasm for good beer. The staff is great at being knowledgeable without being snobby, and has attracted a clientele that fits that bill, too. How do you help people decide what to try? Personally, my initial question is if there’s a style (or styles) someone gravitates towards. If someone doesn’t dig hoppy beers, I won’t try to sell them on a Double IPA; if they’re not into dark beers, Imperial stouts probably aren’t their jam. Conversely, sometimes people who’re really into a particular style want to try something on the opposite end of the spectrum. Other criteria are what the beer’s for: gift? Food pairing? What are the best beers to try as a novice? I think the best beers to try as a novice are “as many as possible.” You won’t know if you love Scotch ales until you try a Scotch ale. That’s definitely one of the benefits to being able to build six packs. What can you recommend now that the weather is getting warmer? I’m a big fan of drinking seasonally. That’s not to say I might not have an oatmeal stout or two during the summer (in air conditioning, anyway), but some buzzwords that come up a lot in the summer months are “after yard work” and “by the grill.” To that end I’m really into lagers and pilsners. Sometimes people can be a little put off by the suggestion because their minds—and taste buds—automatically go to the sort of American macrobrews they’ve come into the Shop to get away from, but if they take a chance to get acquainted with a really well-crafted lager, they’ll typically be happy they did. Do you sell a lot of North Carolina beers? We do indeed. We have a whole section of NC beers. Foothills [of Winston-Salem] starting to bottle was met with as much staff enthusiasm as just about anything else that’s happened in the year and a half that I’ve worked there. What is your best-selling beer? How did Carrboro Beverage Company get started? Tyler [Huntington, owner of local restaurant chain Tyler’s Taproom] obviously has an affinity for great beer, so the Shop was a logical next step. The idea was to provide Carrboro and Chapel Hill with a place to get great beers. A bonus is that if patrons of Tyler’s or the Speakeasy try something the love on tap, they can pick up the beer (or something similar) to take and enjoy at home. 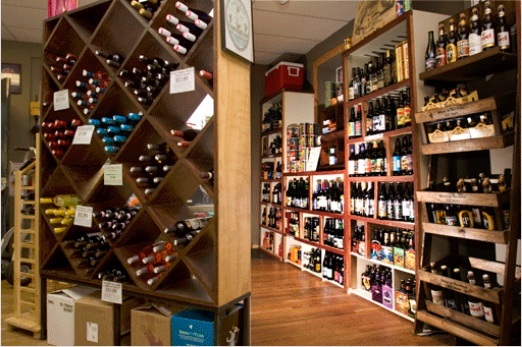 What makes Carrboro a good place for a bottle shop? Carrboro’s a great location for a host of reasons: the sense of community, the passion for supporting local businesses, the pedestrian-friendly nature downtown, and a populace full of folks with pretty sophisticated palates. Tell us about some of the events you guys host at the Shop. We have a scheduled free Thursday night tasting (7 to 9), and have started to do ImprompTuesday tastings, as well (7ish to 9ish), since Tuesdays tend to be the day new stuff comes in. Starting this year, we’ve put an emphasis on larger, extracurricular events (so far, they’ve been hosted at the Speakeasy, although tickets are sold through the Bottle Shop). January was an Imperial IPA tasting, coinciding with the release of Bell’s Hopslam (easily one of the most anticipated releases throughout the year). February was an Imperial Stout tasting, in honor of Foothills’ Sexual Chocolate. March and April were lumped together under our annual Beernament, a blind tasting tournament that put 32 beers in a bracket (8 each from the West, Midwest, East, and South regions) to crown a champion. The people’s palates spoke, and Lonerider’s Sweet Josie Brown came out on top. The best way to keep up on events and special beer releases is to follow the Shop on Facebook and Twitter. 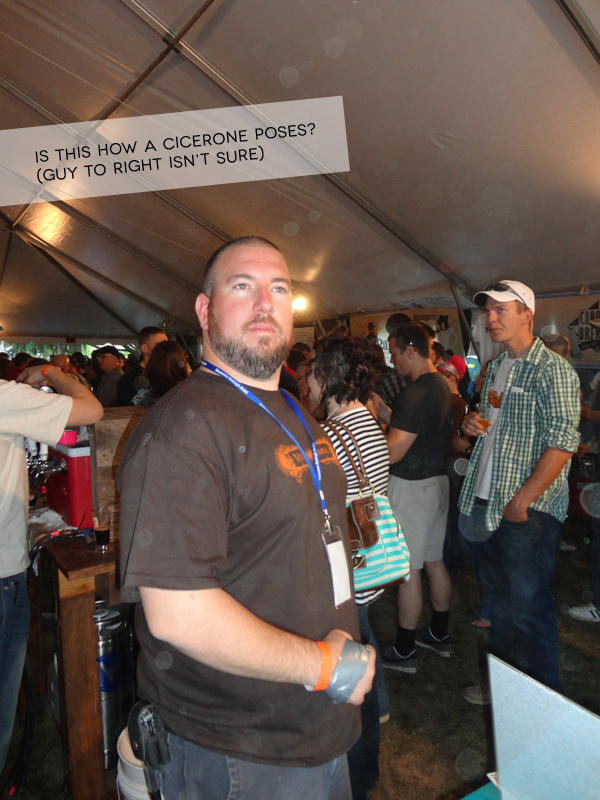 How would you characterize the craft beer community in North Carolina? Thanks, Dan! 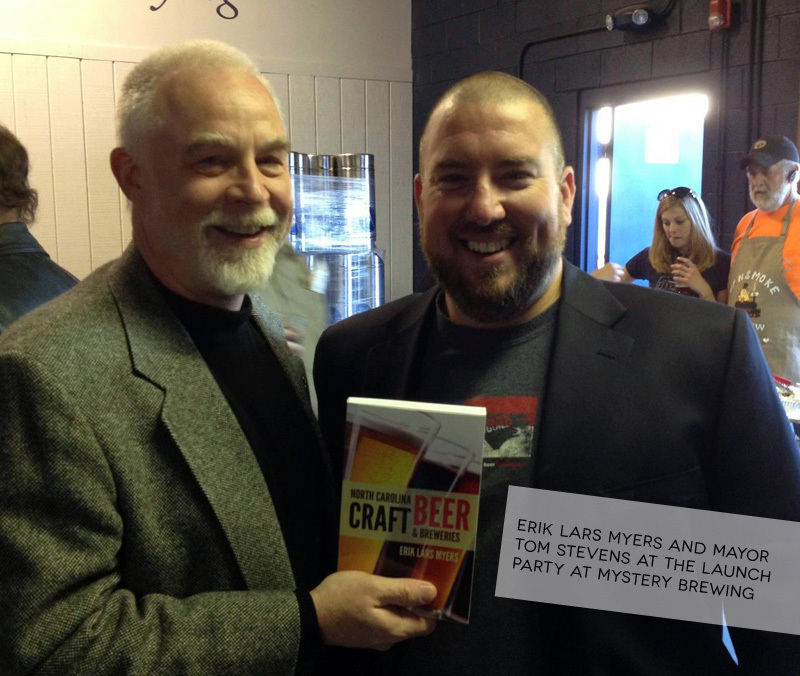 To learn more, check out North Carolina Craft Beer & Breweries by Erik Lars Myers. Myers will be at Carrboro Beverage Company on Wednesday, April 25, from 7 to 9 p.m. If you’re in the area, be sure to stop by, taste some beers, and see what the Shop has to offer! Copies of North Carolina Craft Beer & Breweries will be available. Find us on World Book Night! It’s World Book Night! Which means that across the United States, 25,000 volunteers will distribute 500,000 free books tonight. Their goal is to share the joy and love of reading within their own communities and across the world. And wouldn’t you know it, Blair’s staff members will make up some of these volunteers. Tonight, we’ll give away copies of Ann Patchett’s Bel Canto at Winston-Salem’s Washington Park and downtown at 4th Street & Marshall at 6:30 p.m. Come find us, pick up a free copy of the book, and tell us what you love most about the written word. See you there! Last Tuesday, April 12, marked the official launch of North Carolina Craft Beer & Breweries by Erik Lars Myers. We started things off with a fun and fabulous launch party at Erik’s brewery, Mystery Brewing, in Hillsborough. More than 60 guests attended the launch, including such notables as Sebastian Wolfrum of Natty Greene’s in Greensboro; David Gonzalez, the pub brewer at Foothill’s in Winston-Salem; Tom Stevens, the mayor of Hillsborough; Vanessa C. Shortley of News of Orange County; and Daniel Bradford of All About Beer magazine and founder of the World Beer Festival. We John F. Blair folk were excited to catch up with Elizabeth Woodman of Eno Publishers (check out 27 Views of Asheville, the latest addition to Eno’s 27 Views series), and we enjoyed chatting with the Mystery employees and volunteers who made Erik’s launch such a fabulous success. 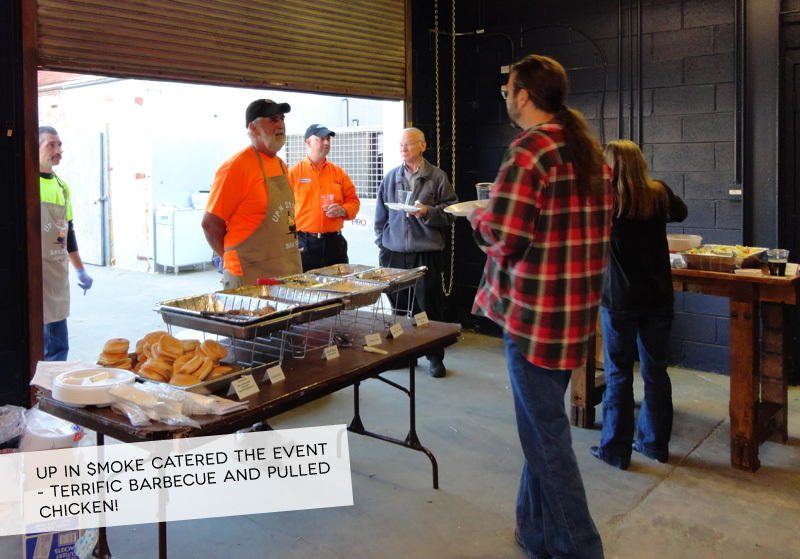 The event was catered by Up in $moke, which served the best barbecue I’ve had since I moved here from Memphis, and the most outstanding pulled chicken and Alabama sauce known to man. Cup-a-Joe’s provided outstanding (and dangerous) chocolate pies, featuring a pretzel crust and made with Mystery Brewing’s chocolate breakfast stout, Six Impossible Things. Mystery Brewing released a new beer, brewed specifically for the launch of North Carolina Craft Beer & Breweries and based on a historic recipe that Erik discovered while researching North Carolina’s brewing history for the book. Named Caswell, this dry beer contains molasses, ginger, wheat, rice, and North Carolina grown barley (and it smells like heaven). Five other Mystery brews were on tap at the party: Mosqueton, a Belgian-style Tripel; Gentlemen’s Preference Blond Ale; Queen Anne’s Revenge, a Carolinian dark that is reminiscent of a black IPA; Six Impossible Things, a chocolate breakfast stout (and, obviously, great with the chocolate pie); and my personal favorite, St. Stephen’s Green Dry Irish Stout. Mystery Brewing is a seasonal-only brewer, so visit the website for a peek into the future of what to expect next from one of the newest breweries in the state. 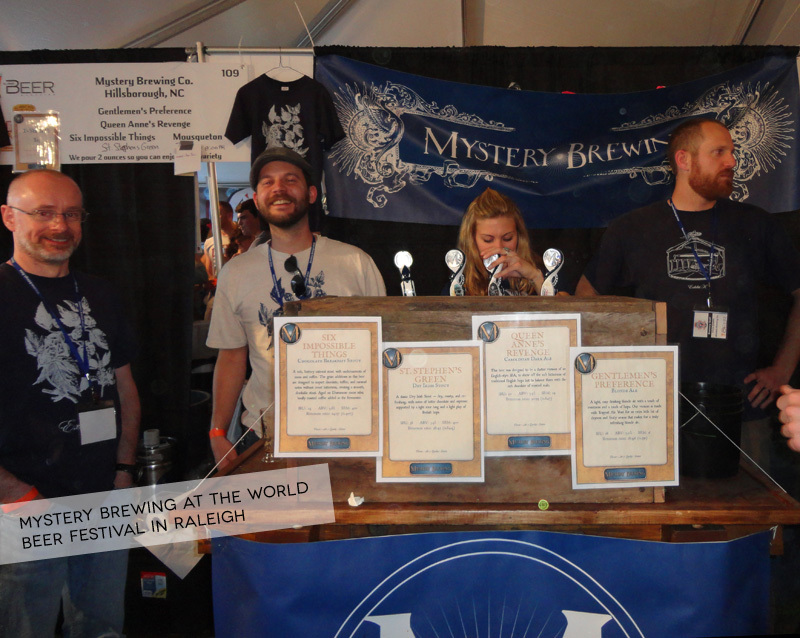 It’s been (and will continue to be) busy times for Erik Lars Myers, who followed the launch party with the brewery’s debut appearance at the World Beer Festival in Raleigh on Saturday, April 14. Blair sold books at a booth next to Mystery at the festival, and I thoroughly enjoyed meeting the brewers and staff at some of my favorite Triangle breweries, including Lonerider (I love Lonerider’s Shotgun Betty and Sweet Josie Brown) and Triangle Brewing, who brews a terrific hefeweizen. (Speaking of fantastic hefeweizens, I was excited to discover that Mother Earth is canning their Sunny Haze!) My favorite newly discovered beer of the evening was Fullsteam’s Beasley Honey White, brewed exclusively for Beasley’s Chicken + Honey in Raleigh. Wednesday evening found Erik at Bottle Revolution in Raleigh, where Erik reports they sold out of books! No worries; he had extra copies on hand. Ted at Bottle Revolution said they had a record night for draft beer sales; the Caswell keg kicked at 6:45 and Six Impossible Things kicked at 8:45. Wow! 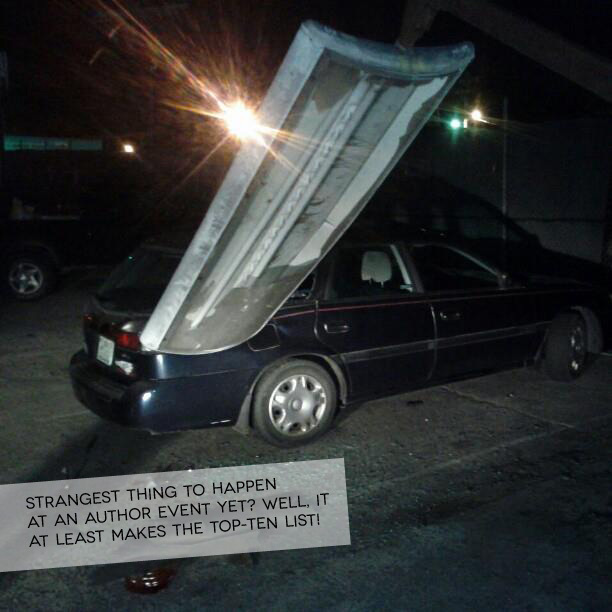 Erik’s author tour is now moving beyond the Triangle. 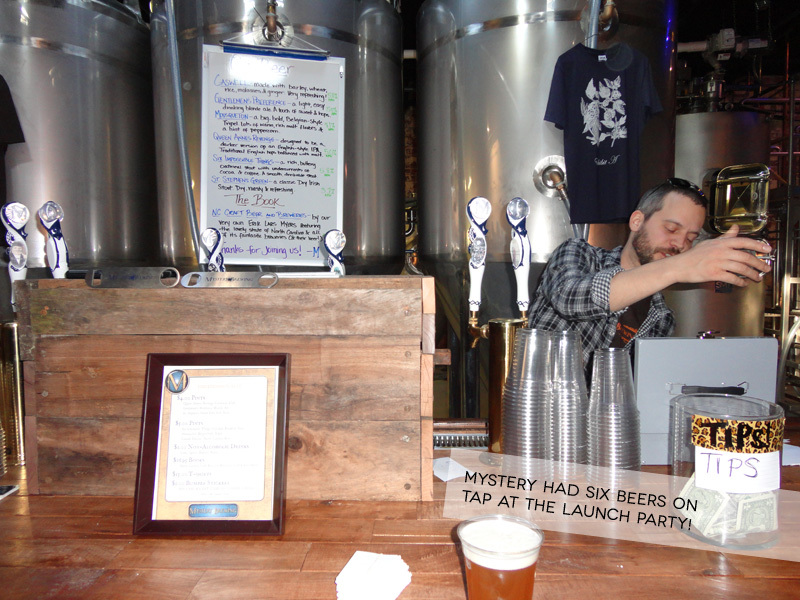 He was at the Olde Hickory Taproom last night, and Mystery Brewing is pouring at Hickory Hops beer festival this Saturday. 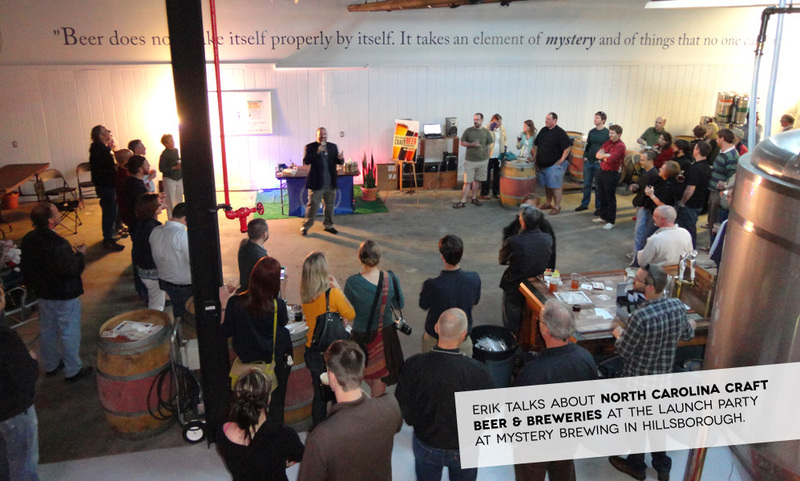 Erik has plenty more upcoming events scheduled at bottle shops, brewpubs, and bookstores across the state. Still to come are Asheville, Charlotte, Wilmington, Winston-Salem, and Greensboro. Check out our events page to find an upcoming event near you! Julie Hedgepeth Williams, author of A Rare Titanic Family: The Caldwells’ Story of Survival (NewSouth Books), joins us again today, so close to the 100th anniversary of the tragic sinking of the RMS Titanic, to share her thoughts on why the story lives on. You can read Julie’s previous guest post about her great-Uncle Albert’s experience on the sinking ship here. If you’d like to hear the Caldwells’ story straight from Albert, head over to Parade, which has an exclusive interview with the man himself (a few years before his death in 1977, Albert recounted his memories of the disaster for his nephew Bill Romeiser, who recorded his comments). April 15 will mark the 100th anniversary of the tragic sinking of the RMS Titanic on her maiden voyage. The story, though, is unsinkable. Why is that? It’s a question many are asking as the century mark approaches. There are, no doubt, many answers, but I believe communication technology of the era deserves some credit. One reason the Titanic endures in our imagination is that so many people survived. That’s contrary to your expectation, probably. The Titanic caused an awful loss of life with some 1,500 victims, some among the most rich and famous in the world. And yet, the approximately 700 people saved, including my great-uncle Albert Caldwell, lived to tell the tale, and they are the ones who compelled the Titanic into our imagination with their vivid stories of the shipwreck. Luckily for my great-uncle, the Titanic had indeed been equipped with the wireless, with which it sent out CQD (a traditional distress call) and then switched to SOS (the newer version of the distress call). However, as Albert told me, the survivors shivering in Lifeboat 13 on April 15 after the Titanic was gone were skeptical that the new technology had worked. They all had been told that ships had been summoned. And yet, the Titanic had not been able to awaken the ship the passengers had all clearly seen for awhile on the horizon as the Titanic struggled to stay afloat. Thus, the survivors in the lifeboats worried that the wireless might actually bring no one to their aid. They didn’t know that, indeed, the wireless message had been picked up at Cape Race, Newfoundland, and sent inland, where the Titanic’s distress call was pulled out of the air by the wireless station on the roof of Wanamaker’s department store in New York. From there the information went to the Hearst newspaper chain, and the news quickly rolled inland. This led to another reason the Titanic still holds such resonance: Thanks to the news via wireless, the sinking of the Titanic unfolded almost in real time. It wasn’t as instantaneous as, say, watching the second hijacked flight slam into the other World Trade Center tower. But for its time and place, the news of the Titanic was practically instantaneous. Albert Caldwell’s parents, back home in the small town of Biggsville, Illinois, read in their newspaper that the Titanic had sunk only a few hours after it went down. They frantically scanned the partial list of survivors. Not seeing the name of their son, their daughter-in-law, or the grandson they had never met, they got down on their knees and prayed earnestly for their family on the Titanic. They spent an anxious day waiting for the next day’s newspaper and were relieved to see that all three were on the “saved” list. For the senior Caldwells and so many around the world, the news played out with a tension seldom known in news events up until that time. We’re used to that now – we often see news events unfold tragically via the live shot of a TV crew on the scene or a citizen journalist who posts images taken on his or her smartphone to the web. In 1912, though, the nearly instantaneous news by wireless was so novel and the tension so high that it seared the Titanic story deeply into public consciousness as a horror more real and more immediate than such things had been before. And when the survivors got home, they added to that realistic drama by telling the story, the deep details making the shipwreck even more tangible to those who weren’t on the ill-fated voyage. I know there are many other reasons the Titanic fascinates. But certainly the new wireless technology contributed in two significant ways to making the Titanic the story that long outlived the ship itself. Julie Hedgepeth Williams is a journalism professor at Samford University. She received a B.A. in English and history from Principia College in Elsah, Illinois, and a Master’s in journalism and a Ph.D. in mass communications from the University of Alabama. She lives in Birmingham, Alabama. It’s not often we get to attend beer festivals and call it work, but–lucky us!–we have that chance this Saturday, April 14. Join us at the Raleigh World Beer Festival, where we’ll be selling North Carolina Craft Beer & Breweries. 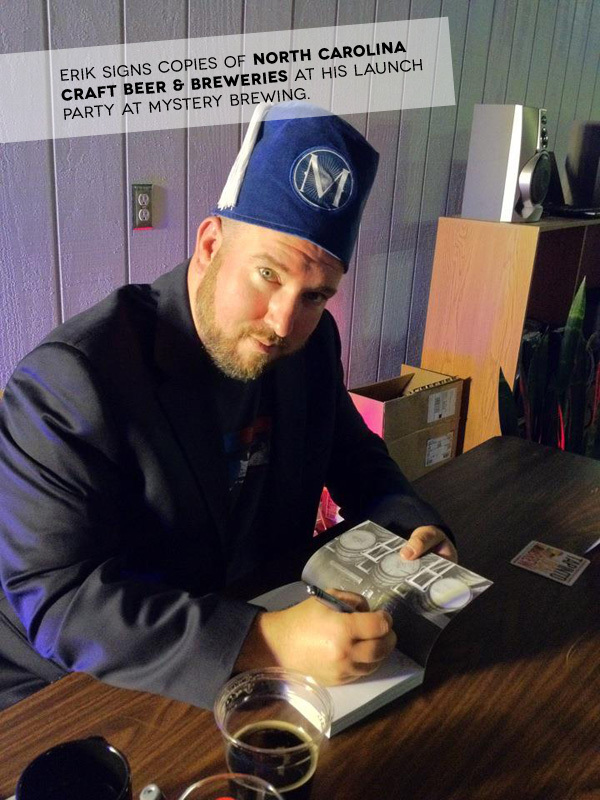 Grab a cold beer (or several), get your copy of the book, and have author Erik Lars Myers sign it right there (he’ll be at the Mystery Brewing booth nearby). Congrats to our Foreword Reviews Book of the Year finalists! Several Blair and distributed titles were chosen as finalists for Foreword Reviews’ Book of the Year Awards. The awards were established to bring increased attention from librarians and booksellers to the literary achievements of independent publishers and their authors. ForeWord is the only review journal devoted exclusively to covering books from independent houses—ranging in size from university presses publishing up to a hundred titles a year to niche, POD, and small presses who may publish one title in a lifetime. Winners will be announced Saturday, June 23, at the American Library Association Conference in Anaheim, California. Congrats and good luck to our Blair and distributed finalists!